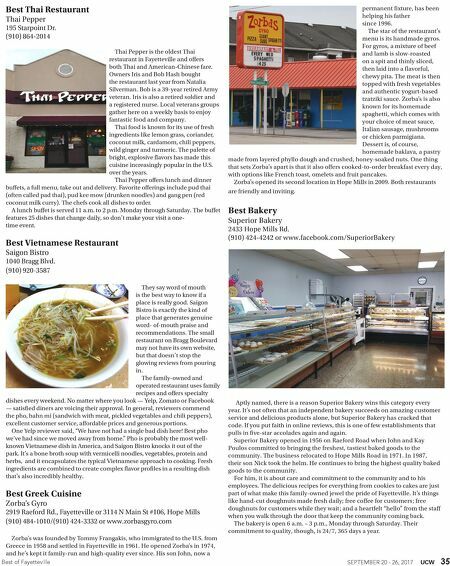 SEPTEMBER 20 - 26, 2017 UCW 35 Best of Fayetteville Best Thai Restaurant Thai Pepper 195 Starpoint Dr. (910) 864-2014 Thai Pepper is the oldest Thai restaurant in Fayetteville and offers both Thai and American-Chinese fare. Owners Iris and Bob Hash bought the restaurant last year from Natalia Silverman. Bob is a 39-year retired Army veteran. Iris is also a retired soldier and a registered nurse. Local veterans groups gather here on a weekly basis to enjoy fantastic food and company. Thai food is known for its use of fresh ingredients like lemon grass, coriander, coconut milk, cardamom, chili peppers, wild ginger and turmeric. The palette of bright, explosive flavors has made this cuisine increasingly popular in the U.S. over the years. Thai Pepper offers lunch and dinner buffets, a full menu, take out and delivery. Favorite offerings include pud thai (often called pad thai), pud kee mow (drunken noodles) and gang pen (red coconut milk curry). The chefs cook all dishes to order. A lunch buffet is served 11 a.m. to 2 p.m. Monday through Saturday. The buffet features 25 dishes that change daily, so don't make your visit a one- time event. Best Vietnamese Restaurant Saigon Bistro 1040 Bragg Blvd. (910) 920-3587 They say word of mouth is the best way to know if a place is really good. Saigon Bistro is exactly the kind of place that generates genuine word- of-mouth praise and recommendations. The small restaurant on Bragg Boulevard may not have its own website, but that doesn't stop the glowing reviews from pouring in. The family-owned and operated restaurant uses family recipes and offers specialty dishes every weekend. No matter where you look — Yelp, Zomato or Facebook — satisfied diners are voicing their approval. In general, reviewers commend the pho, bahn mi (sandwich with meat, pickled vegetables and chili peppers), excellent customer service, affordable prices and generous portions. One Yelp reviewer said, "We have not had a single bad dish here! Best pho we've had since we moved away from home." Pho is probably the most well- known Vietnamese dish in America, and Saigon Bistro knocks it out of the park. It's a bone broth soup with vermicelli noodles, vegetables, protein and herbs, and it encapsulates the typical Vietnamese approach to cooking. Fresh ingredients are combined to create complex flavor profiles in a resulting dish that's also incredibly healthy. Best Greek Cuisine Zorba's Gyro 2919 Raeford Rd., Fayetteville or 3114 N Main St #106, Hope Mills (910) 484-1010/(910) 424-3332 or www.zorbasgyro.com Zorba's was founded by Tommy Frangakis, who immigrated to the U.S. from Greece in 1958 and settled in Fayetteville in 1961. He opened Zorba's in 1974, and he's kept it family-run and high-quality ever since. His son John, now a permanent fixture, has been helping his father since 1996. The star of the restaurant's menu is its handmade gyros. For gyros, a mixture of beef and lamb is slow-roasted on a spit and thinly sliced, then laid into a flavorful, chewy pita. The meat is then topped with fresh vegetables and authentic yogurt-based tzatziki sauce. Zorba's is also known for its homemade spaghetti, which comes with your choice of meat sauce, Italian sausage, mushrooms or chicken parmigiana. Dessert is, of course, homemade baklava, a pastry made from layered phyllo dough and crushed, honey-soaked nuts. One thing that sets Zorba's apart is that it also offers cooked-to-order breakfast every day, with options like French toast, omelets and fruit pancakes. Zorba's opened its second location in Hope Mills in 2009. Both restaurants are friendly and inviting. Best Bakery Superior Bakery 2433 Hope Mills Rd. (910) 424-4242 or www.facebook.com/SuperiorBakery Aptly named, there is a reason Superior Bakery wins this category every year. It's not often that an independent bakery succeeds on amazing customer service and delicious products alone, but Superior Bakery has cracked that code. If you put faith in online reviews, this is one of few establishments that pulls in five-star accolades again and again. Superior Bakery opened in 1956 on Raeford Road when John and Kay Poulos committed to bringing the freshest, tastiest baked goods to the community. The business relocated to Hope Mills Road in 1971. In 1987, their son Nick took the helm. He continues to bring the highest quality baked goods to the community. 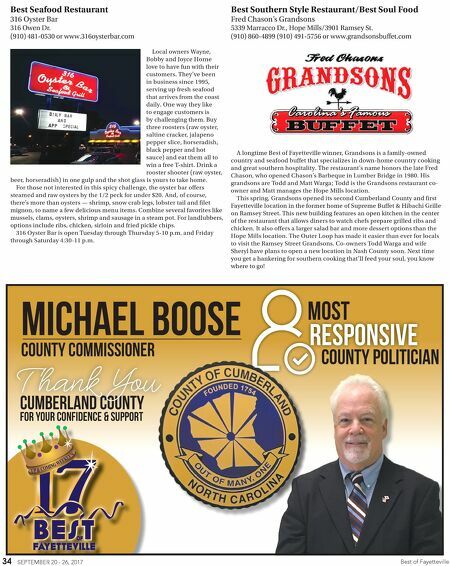 For him, it is about care and commitment to the community and to his employees. The delicious recipes for everything from cookies to cakes are just part of what make this family-owned jewel the pride of Fayetteville. It's things like hand-cut doughnuts made fresh daily; free coffee for customers; free doughnuts for customers while they wait ; and a heartfelt "hello" from the staff when you walk through the door that keep the community coming back. The bakery is open 6 a.m. – 3 p.m., Monday through Saturday. Their commitment to quality, though, is 24/7, 365 days a year.